"ENERGY: MIT researchers image fusion reaction"
Massachusetts Institute of Technology researchers have described a new method of imaging nuclear fusion reactions. The technique uses a second fusion reaction as a "flash" to photograph a reaction designed to generate energy. As a result, the researchers now have a way of measuring their success as they proceed toward clean, safe nuclear fusion reactors. The "flash" camera methodology uses matter (protons), instead of light (photons). Unlike photons, protons have a charge, and thus can image the electrical and magnetic fields surrounding a nuclear fusion reaction. "OPTICS: 300-Gbit/second PCB bus goes optical"
IBM Corp. described what it claims is the world's first optically-connected circuit board on Thursday (Feb. 28) at the Optical Fiber Communication Conference in San Diego. Researchers at IBM's Thomas J. Watson Research Center (Yorktown Heights, N.Y.) said the 300-Gbits/sec optical interconnect was lithographically patterned atop an otherwise conventional pc-board. Gallium arsenide transceivers were used to convert normal electrical signals into light. "OPTICS: Silicon photonics goes mainstream"
Silicon photonics is ready for prime time, according to presenters at the Optical Fiber Communication Conference and Exposition this week in San Diego. The move from copper twisted pairs--which consume from seven or more watts to transmit and receive 10-Gbits/second of network traffic--to optical fibers can cut power consumption ten fold, proponents say. Moving further to silicon-based optical components could cut power by half again while driving down costs with CMOS integration. 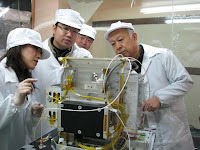 "CHIPS: MRAMs headed for orbit"
MRAM technology is headed for orbit with the launch of SpriteSat by the Japan Aerospace Exploration Agency. According to Angstrom Aerospace Corp. (Uppsala, Sweden), its microelectromechanical system (MEMS)-based magnetometer will use MRAM to replace both static RAM and flash memory on the Japanese research satellite. "ENERGY: GM unveils dual-mode hybrid"
General Motors (GM, Detroit) claims that its dual-mode hybrids one-up Toyota's single-mode hybrid by using multiple microcontrollers from Freescale Semiconductor Inc. (Austin, Texas) to achieve superior gas savings. First generation single-mode hybrids only yield mileage savings when used in stop-and-go city traffic, but GM's new dual-mode hybrids employ a second electric motor and complex control of transmission gearing to achieve gas savings during highway driving, too. "NANOTECH:Nanoparticles could make hydrogen cheaper than gasoline"s"
The hydrogen economy is getting a shot in the arm from a start-up that says its nanoparticle coatings could make hydrogen easy to produce at home from distilled water, and ultimately bring the cost of hydrogen fuel cells in line with that of fossil fuels. 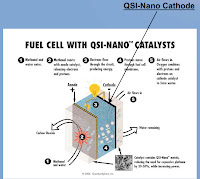 QuantumSphere Inc. says it has perfected the manufacture of highly reactive catalytic nanoparticle coatings that could up the efficiency of electrolysis, the technique that generates hydrogen from water. Moreover, the coatings could also eliminate the need for expensive metals like platinum in hydrogen fuel cells. Boasting 1,000 times the surface area of traditional materials, the coatings can be used to retrofit existing electrolysers to increase their efficiency to 85 percent--exceeding the Department of Energy's goal for 2010 by 10 percent. The scheme holds the promise of 96 percent efficiency by the time cars powered by hydrogen fuel cells hit automobile showrooms, according to the Santa Ana, Calif., company. "ENERGY: Silicon carbide ready for prime time"
The National Aeronautics and Space Administration thinks silicon carbide is ready to replace silicon in circuitry that must withstand ultrahot temperatures--as high as 1,000 degrees F--or deliver ultrahigh power. Prototypes of the world's first commercial SiC integrated circuit, which NASA has contracted with Inprox Technology Corp. (Boston) to jointly design and fabricate, are due out by the end of 2008. The position sensor is being designed to measure linear motion inside NASA's turbine propulsion engines, but Inprox also plans to repurpose it for automotive engine control as well as for high-power, high-temperature industrial applications. "PODCAST: Week-in-Review, Feb. 23, 2008"
"ALGORITHMS: Multimedia exhibit combines art, visualization technology"
If you're in New York City this weekend, may we suggest a visit to the Museum of Modern Art on Sunday (Feb. 24) to view an innovative multimedia exhibit entitled: "Design and the Elastic Mind." 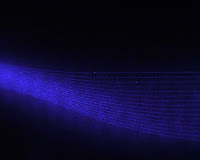 The exhibit includes art inspired by 3D animations of telecommunications traffic between New York and the rest of the world. The exhibit is a cooperative effort of the AT&T and the "New York Talk Exchange" project at the Massachusetts Institute of Technology. "CHIPS: IBM unveils atomic memory advance"
The design of atomic-scale magnetic memories got a boost Friday (Feb. 22) with an announcement from IBM Corp. researchers that they have manipulated individual cobalt atoms. The first successful characterization of the force required to move magnetic atoms on a surface suggests that IBM's technique is a prelude to future bit-cells holding just a few atoms. Even the densest magnetic memories use 1 million or more atoms to store a single bit. However, last fall IBM's Almaden Research Center (San Jose, Calif.) demonstrated how to measure a single atom's ability to store a bit, called magnetic anisotropy. 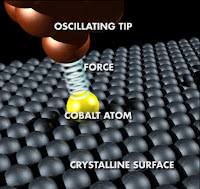 That demonstration used a scanning tunneling microscope (STM) to send a current through a cobalt atom. However, sending a current tunneling through an atom using STM requires placing it on an insulating monolayer measuring only one-atom thick. Since then, IBM researchers discovered that such thin insulating layers will not work for storing bits on cobalt atoms. Instead, thick insulators are required that preclude the tunneling action of STMs. Hence, Almaden scientists had to devise a different method for moving cobalt atoms into place for future atomic-scale memories. "MATERIALS: Power suit: Researcher weaves nanogenerators into fabrics"
Clothing fabrics that generate electricity from the motion of wearing them have been described by researchers at the Georgia Institute of Technology. The inventor, Georgia Tech professor Zhong Lin Wang, has previously described nanogenerators--arrays of nanowires that produce as much as 4 watts/cm3--for powering small electronic devices or to recharge batteries. Wang has also designed nanogenerators to power self-contained sensors that harvest environmental energy thereby eliminating the need for batteries. 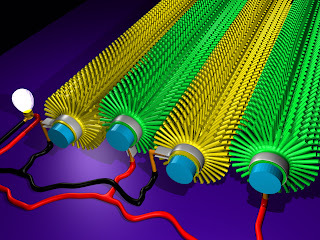 Alternating pairs of fibers with zinc oxide bristles rub against each other to generate electricity. Wang's latest invention--fabrics that generate energy from the wearer's motion--are the furthest from commercialization. Besides clothing, the nanogenerating fibers could also be woven into curtains, tents or other structures that capture energy from wind, sound vibration or other mechanical energy. "CHIPS: Freescale remains top auto chip supplier"
The world's biggest supplier of automotive processors remans Freescale Semiconductor Inc., which has shipped its 100 millionth Power Architecture microcontroller. Freescale (Austin, Texas) claims 45 percent of the automotive processor market with its 32-bit flash-memory microcontrollers. It shipped 30 million units in 2006, up from 2005, when it also claimed to be the world's No. 1 supplier of automotive microcontrollers. "CHIPS: NEC fabs flexible nanotube transistors"
Green printing technology has enabled researchers at NEC Corp. to fabricate high-speed carbon nanotube transistors on inexpensive flexible polymer substrates. NEC claims its nanotube transistors are 100 times faster that competing flexible organic transistors, while its printing technique produces 90 percent fewer greenhouse gases than silicon transistors. NEC presented its research results last week at the International Nanotechnology Exhibition & Conference last week in Tokyo. Organic transistors enable circuitry to be printed at room temperature on flexible polymer substrates, vastly lowering chip manufacturing costs compared to the high-temperature chemical vapor deposition processes. Low-temperature processing also produces less C02 gas, uses less water and produces fewer toxic byproducts than traditional silicon chip processing. 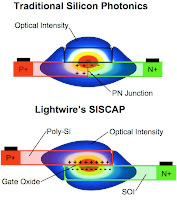 However, the electron mobility of organic transistors is dismal compared to silicon. NEC also claims to have combined the high-speed of carbon nanotube transistors with the low-temperature processing, resulting in transistors that are printable on organic substrates with electron mobilities 100 times greater than typical organic transistors. "PODCAST: Week-in-Review, Feb. 16, 2008"
"MEDICAL: Thin-films hold promise for implantable pharmacies-on-a-chip"
Thin-films are enabling implantable pharmacies-on-a-chip that use electric fields to dispense drugs on-demand, rather than depend on patients remembering to take their meds. The implants could also be located directly at the site where they are needed; for instance, automatically dispensing cancer drugs at a surgery site when active circuitry on the chip senses that an excised tumor starts to regrow. "WIRELESS: IMEC tunes in to software defined radio"
A software-defined-radio chip design capable of speeds in excess of 100 megabits per second (Mb/s) is available for licensing from the Interuniversity Microelectronics Center (IMEC; Leuven, Belgium). The design, which is currently being prototyped at a foundry, enables a single baseband chip to use software to dynamically reconfigure its operation for worldwide standard mobile-device bands, including WiFi (802.11n), WiMax (802.16e), mobile TV and the 3GPP LTE (third-generation partnership project for long-term evolution). IMEC, a European design center, is offering licenses to chip makers who want to supply mobile-device makers with a single baseband chip that tunes to multiple bands with software alone. As more embedded applications use Internet Protocol, the need for security using encryption/decryption and authentication is trickling down to embedded devices, and vendors are rising up to meet the need with chips and firmware. Next month, the Department of Homeland Security will conduct Cyber Storm 2 to test the nation's readiness to weather electronic attacks on U.S. information infrastructures, transportation lines and utilities. During the first Cyber Storm, in 2006, hackers successfully attacked the very computers being used to conduct the test. 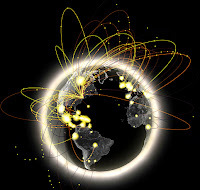 Technology vendors worldwide have been working since then to plug security holes. "MATERIALS: First GHz chip to be interconnected with nanotubes"
Copper interconnections on CMOS could become a bottleneck as future chips get faster. One solution could be harnessing carbon nanotubes, which have much higher electron mobility. Until now, however, researchers have been unable to perfect a method for coaxing the nanoscale carbon tubes into the correct positions on chips. Now, one group thinks they have the answer. The world's first CMOS circuit using nanotubes as an interconnect was recently designed at Stanford University, in cooperation with Toshiba Corp. I t was fabricated by Taiwan Semiconductor Manufacturing Co. Ltd. (TSMC). The 256 ring oscillators on the 11,000- transistor chip ran at 1 GHz, rivaling the speed of other advanced CMOS chips (the iPhone's processor runs at 700 MHz). "MATERIALS: Solder made obsolete by growing copper pillars"
Soldering chips to boards may become a thing of the past as a result of research on copper materials sponsored by Semiconductor Research Corp. (SRC, Research Triangle Park, N.C.) at the Georgia Institute of Technology. Using an electroless plating process, future chips may be attached to circuit boards with copper pillars without solder. The research group has developed a method to turn ordinary copper traces on printed-circuit boards into ultra-high frequency coaxial transmission lines. "AEROSPACE: Space tugboat set for March launch"
The world's first space tugboat--the "Jules Verne" Automated Transfer Vehicle (ATV)--is scheduled for launch next month aboard the Ariane 5 launch vehicle at the European Space Agency spaceport in Kourou, French Guiana. The 20-ton unmanned space tugboat is designed to resupply the International Space Station, delivering supplies like air, water and food as well as spare parts, equipment and experiment modules. The Jules Verne was built by Astrium, an aerospace subsidiary of the European Aeronautic Defense and Space Co., and will be placed in orbit 250 miles above the Earth. Launch is scheduled for March 8. "WIRELESS: Robert Redford pitches mobile phone as '4th screen' at confab"
Film star Robert Redford, at the Mobile World Congress this week (Feb. 11-14, 2008), will claim that the mobile phone is the "4th screen"--after theater, television and the iPod--extending the reach of movies to new audiences in the global community. Several firsts at the Congress will include a WiMax mobile handset reference design from chip maker NextWave Wireless Inc. (San Diego), created in partnership with industrial design house Elektrobit Corp. (EB, Oulunsalo, Finland). Also, a partnership to create the first on-chip hardware accelerator for detecting viruses will be announced by communications processor maker Freescale Semiconductor Inc. (Austin, Texas), in partnership with Qosmos (Paris)--a spin-off of the Laboratoire d'Informatique de Paris (LIP6)--which specializes in detecting viruses and other malware. "PODCAST: Week-in-Review, Feb. 11, 2008"
"WIRELESS: Cell phones get the call for personal navigation"
If you are like me (that is, always running late), then a personal navigation device borders on divine intervention. Rather than download Mapquest routes into my computer, print them out, then fiddle with the paper maps while driving, the personal navigation device gives me turn-by-turn instructions in real time--as if I had an expert navigator riding shotgun. Unfortunately, the current price of most personal navigation devices is still in the $400 to $700 range. As an alternative, you might consider upgrading your cell phone to one with a built-in global positioning system (GPS) and paying as little as $4.16 per month to have it give you directions. "CHIPS:TI reveals details of 45-nm process"
The first 45-nanometer chip to be designed by Texas Instruments, and fabricated by a foundry, uses new processing technology never before revealed by TI. The design details of the 45-nanometer process used to lower power by 63 percent and increase performance by 55 percent, compared with its 65-nanometer process, will be revealed Tuesday (Feb. 5) by TI at the International Solid-State Circuits Conference here. Now that TI is sampling its first 3.5G baseband and multimedia processor using its 45-nm process, the company will reveal how strained silicon, immersion lithography and ultra-low K dielectrics enabled it to double the number of chips produced on each 45-nm silicon wafer, while simultaneously achieving its lower power and higher performance goals. The 3.5G baseband processor is used by OEMs to create smaller, lower profile, portable 3.5G devices, such as mobile handsets, with advanced multimedia functionality--including high-definition video playback, longer video recording and multitasking--without reducing the battery life. "CHIPS: TI, MIT team to design ultra-low voltage chip"
Texas Instruments claims its 16-bit microcontroller is the world's lowest-power device, but a new version implementing an experimental design technique conceived at the Massachusetts Institute of Technology promises another 10-fold cut in power consumption. The new low-power chip design will be described Tuesday (Feb. 5) by TI and MIT engineers at the International Solid State Circuits Conference in San Francisco. "These design techniques show great potential for future low-power integrated circuits," said Dennis Buss, chief scientist at Texas Instruments. The design technique works by powering parts of the chip at just 0.3 volts, or as much as 10 times less power than normal. This was accomplished by designing on-chip, high-efficiency DC-to-DC conversions to operate circuitry that normally hogs current. The system-on-a-chip solution required redesigning select memory and logic circuits to operate at the lower voltage. "SECURITY: Navy demos railgun to fire projectiles 250 miles"
An electromagnetic catapult, or railgun, is on track for deployment on U.S. warships around 2012, according to the Office of Naval Research (ONR). A railgun, which uses electricity to magnetically accelerate munitions down a track, shoots metal projectiles that hit targets at supersonic speed. They can also cause more damage than a high-explosive without collateral destruction. With GPS-enabled targeting accuracy of 15 feet, when shot from warships up to 275 miles away, the non-explosive railgun projectiles could also protect Navy personnel without requiring dangerous explosives onboard. In the Navy's latest test made history with the world's fastest muzzle velocity of 5,637 miles per hour--generating a record 10.6 megajoules of energy (1 joule = 1 watt-second). The test was performed at the Naval Surface Warfare Center (Dahlgren Va.). "PODCAST: Week-in-Review, Feb. 4, 2008"
"MEMS: enables electrically trimmable passive resistor"
The inner workings of the world's first analog integrated circuit to incorporate electrically adjustable passive resistors will be described at the International Solid State Circuits Conference. ISSCC is being held Feb 3-8 in San Francisco. Microbridge Technologies Inc. will detail a trimmable Wheatstone bridge for piezoelectric sensors, made adjustable by virtue of its patented "rejustor" technology based on microelectromechanical systems. "MEMS: HP unseats TI at top of MEMS rankings for 2007"
The microelectromechanical-systems market grew 9 percent last year, to $7 billion, with the top 30 MEMS makers logging a collective $5.6 billion in revenue and growing an average of 7 percent, according to market watcher Yole Développement (Paris). Nine companies tallied sales above $200 million. Hewlett-Packard displaced Texas Instruments as the top-ranked MEMS supplier in 2007 on the strength of its printer sales, which use MEMS inkjet heads, Yole said. Automotive applications continued to drive the MEMS market overall, but consumer products showed the fastest growth rate, with Analog Devices Inc. and STMicroelectronics each recording more than 20 percent growth, largely from accelerometer design wins in Nintendo's Wii (both ST and ADI) and Apple's iPhone (ST). Knowles Acoustics, with its silicon microphone, and Avago Technologies, with its film bulk acoustic resonator (FBAR), achieved the MEMS industry's fastest growth rates, each exceeding 35 percent. "MATERIALS: Polymer aims to streamline chip fabs"
A cheaper, quicker-curing polymer aims to lower the cost and improve the efficiency of fabricating semiconductors, according to researchers at the Rensselaer Polytechnic Institute. Working with materials experts at Polyset Company Inc. (Mechanicville, New York), the new formulation of polyset epoxy siloxane (PES) could enhance semiconductor performance for conventional photolithography, as well as ease the transition to nanoimprint lithography.